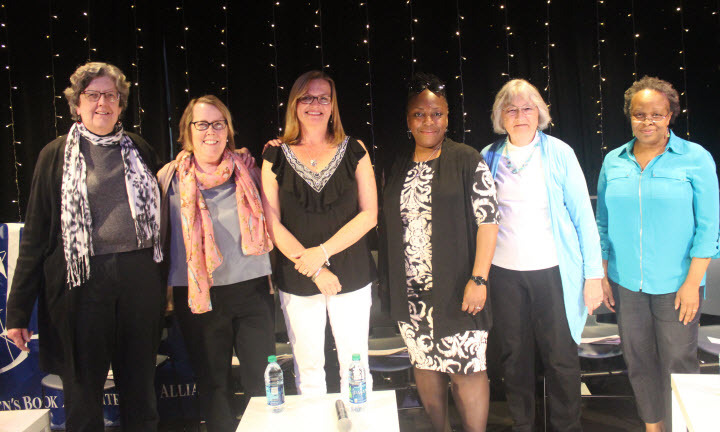 Katherine Paterson, Rita Williams-Garcia, Jeannine Atkins, Ekua Holmes, and Heather Lang participated in the panel discussion entitled CELEBRATING HEROINES IN FACT AND FICTION. Our objective was to highlight the literary and artistic work of this extraordinary panel that is of special interest to girls and young women, work that celebrates heroines in fact and fiction. It is our hope that when young people, parents, teachers, and librarians read and share these authors’ books, it will provide inspiration, encouraging everyone to explore their own creativity and leadership potential in the greater world, both personally and professionally. To watch the event video, to read more information about the participating authors and illustrator, to review and download copies of the supplemental education resource guides, and to discover other valuable articles and videos, visit our Girls Read | Guys Read page. The event video is separated into thematic segments. The education resource guides feature engaging activities and discussion questions for use in your classroom, library, or home for each participating children’s book creator. Also included on the Girls Read | Guys Read page is an extensive bibliography of picture books, fiction, nonfiction, and websites featuring strong female characters. The National Children’s Book and Literacy Alliance expresses sincere gratitude to its partners An Unlikely Story Bookstore & Cafe and WETA Public Television/Reading Rockets for collaborating with us on this inspirational event. You can find more information about An Unlikely Story Bookstore & Cafe on their website AnUnlikelyStory.com. Learn more about WETA Public Television/Reading Rockets, and discover a treasure trove of educational materials, at ReadingRockets.org. Left to right: Grace Worcester Greene, Jeannine Atkins, Heather Lang, Ekua Holmes, Katherine Paterson, and Rita Williams-Garcia.